iPECS from Ericsson-LG is a pure IP communication solution developed with the small and medium size business in mind. Its design is modular so it is easy to grow as your business grows and with a fully distributed IP architecture it provides your business with the latest productivity tools and communication applications where ever your offices or staff are located. The value of any solution to an enterprise must be tied to the quantifiable results it can deliver to the organization. As an enterprise expands, these results become apparent as their workforce becomes mobile, global, and dependent on ease of communications and collaboration. For the business to perform and stay competitive, enterprises need tools that interoperate well together and bring fast, well informed, critical decision making that facilitates faster, more efficient performance in the work environment. To meet the enterprise needs, Ericsson-LG offers the iPECS, converged IP Communication Solutions, that delivers a complete product lineup for unified communications including voice, data and applications for small to large enterprises. iPECS call servers and gateways are at the heart of the iPECS solutions that have highly reliable hardware and software, fully distributed IP architecture and rich set of easy to use features. The role of competent communication technologies is needed as a strong foundation for the smooth functioning of a business to interact effectively within an office or building. Deploying the innovative telecommunication technologies helps in the effective flow of information among the various hierarchical levels of an organization. B2BCOMZ can deliver the best possible solutions to ease the communications and collaborations among businesses. No matter, whether you have a small, mid-size or big enterprise, we can provide you with the finest services at affordable prices. Internet Protocol integrated telephone systems from B2BCOMZ are an ideal choice for small and medium sized businesses. Ipecs phones of various configurations can improve the efficiency and effectiveness of inter-office communications. Incorporated with rich applications, this fully distributed IP architecture can simplify your business operations. 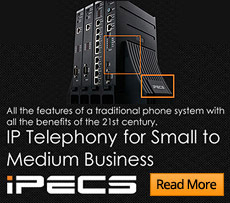 Confirmed with the highest standards, ipecs phone systems extend the advantages of IT telephony to its fullest. Purchasing an ipecs 50, ipecs 200 or any other configuration is a sound investment for your organization. A highly reliable hardware and software components of ipecs 50 avoid the chances of telephone tags and delayed response times. It improves employee productivity and the customer calling experience. At B2BCOMZ, we supply state-of-the-art pabx systems that can greatly contribute to your company's success. From the standard IP phone lip-8012d to the latest aria phones and everything in between, we can provide you with the most simple and secure solutions. Be rewarded with the benefits of a leading edge business phone systems and technology.